A small mercy and offer of solidarity created a respite from the latest wave of anti-Muslim bigotry amid the developing Sydney siege. Tessa Kum (@sirtessa) created the hashtag #illridewithyou in solidarity with any visible Australian Muslim riding the 373 bus in Sydney. Thousands of tweets later and the sense of solidarity and positive sentiment went far beyond its Sydney origins. Hadn't seen the #illridewithyou but leaving the city today on a crowded bus and no one would sit next to a woman in a head scarf. So I did. Others used the hashtag to express a heartfelt sense of pride and extending sense of solidarity. 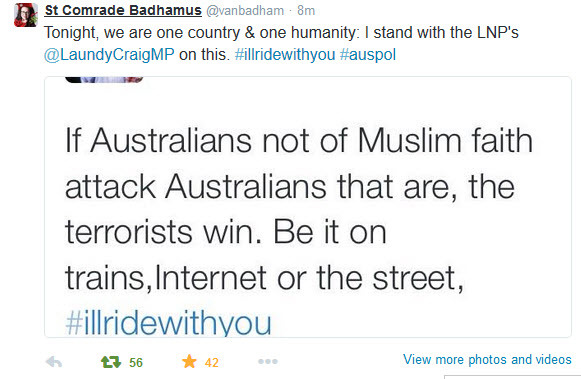 #illridewithyou this is terrific, gives me much hope. Bravo. No hashtag will erase anti-Muslim sentiment or the racism that permeates cultures but in a small way reminds us of a common good. Solidarity is simple to express online but extending it into the real world is worth celebrating. The hashtag generated over 40,000 tweets and will continue to grow.